Occasional Toronto: "You Call This Spring!" I spotted this robin last week just days before we had several days of rain, ice pellets and freezing rain and the poor bird didn't look too happy then so now it must really be in a mood! It has been an April to remember so far! Love to see the Robins! Hello, our weather has been much of the same. I guess the birds adjust to the cold weather. Cute shot of the Robin! Thank you for linking up and sharing your post. Happy Saturday, enjoy your weekend! The robins were staying in the road when we had all that ice... the only flat place that they could hop about. The robins in Toronto are more red then the ones in Amsterdam. I haven't seen any robins down this way for a long time. They must have headed up to Toronto! Lovely photo, Pat. 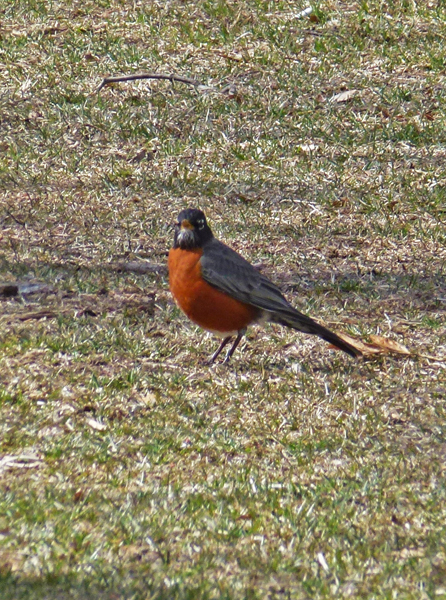 I get really excited when I see the first robin in the yard. It always signals spring to me. Nice shot! During last week's snow storm I came across a flock of robins that just looked confused. Perhaps they are happier now that the snow has begun to melt. Great shot. Looks like spring. Robins are tough birds . They eat berries before the worms become active. Some robins stay all winter. Lovely wee bird, no wonder if has a quizzical expression Pat, I bet you are all wondering what is going on with the weather! Poor thing! Good reason to be unhappy. Hope you and the robins get some decent Spring weather soon. It finally feels like April and not January 93rd. He is such a pretty bird! I do miss seeing robins like this. I hope your weather improves soon so he can get back to a better mood.